A recent Slate article by Jonathan Katz talks about a map that is displayed at the CDC – as well as the heavy implications of this map. Despite genomic evidence that the UN peacekeepers were the source of cholera in earthquake-devastated Haiti, the CDC and the UN continue to avoid accountability. UN peacekeepers from Nepal failed to set up proper sanitation containment upon coming to Haiti. They brought with them cholera, which leaked into the waterways in Haiti and spread across a country that had never experienced the infection before. The map in question shows a different story than what really happened – the CDC’s effort to gloss over their mistakes and spin the tale as one of the UN helping rather than harming. The article is definitely worth a read since it goes into detail on the Haitian cholera outbreak and implications of this map display. Although there is a lawsuit against the UN regarding the situation, it is clear that some officials are trying to keep the whole fiasco away from public attention. The lack of accountability for the outbreak is irksome, especially if future generations of students learn about it from the skewed lens of this CDC map and the narrative it portrays. 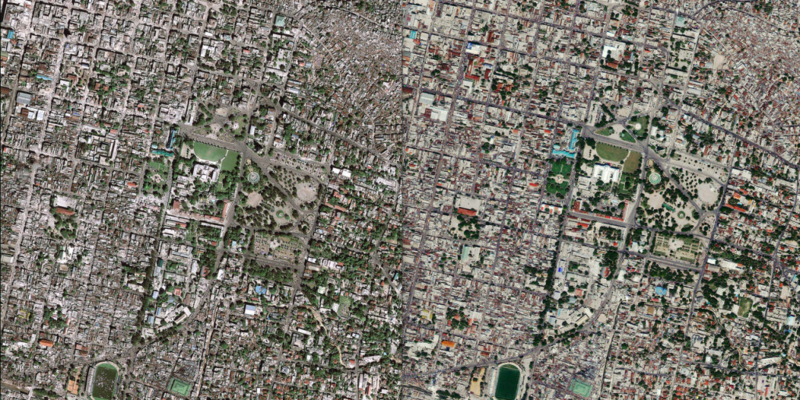 Before (right) and after (left) aerial shots of the earthquake in Haiti, via USGS on Flickr (public domain license).